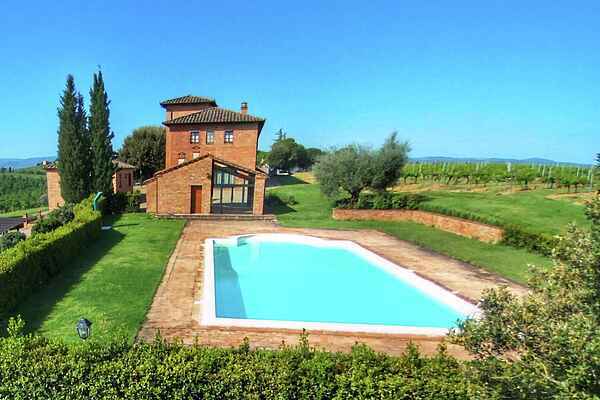 Near the medieval town of Montepulciano is a beautiful winery with eight apartments and a swimming pool. The agriturismo is located in the rolling hills of grain fields and typical rows of cypress trees. This particular agriturismo is a former monastery dating from the eleventh century. The friendly owner grows here the famous wine: Vino Nobile di Montepulciano and Rosso di Montepulciano. The rooms of the former monastery have been converted into elegant apartments. The furnishing of the apartments is stylish, with antique furniture. The agriturismo situated in a strategic position to visit all the surrounding towns and villages and the owner will gladly help you in finding the most fascinating places and the best restaurants. At the agriturismo are two small lakes for fishing, there are several hiking trails and it is nice to cycle in the area. In the immediate vicinity are tennis courts, a golf course, an equestrian center and the thermal baths. It is possible to purchase Montepulciano wine and olive oil at the agriturismo. Enjoy a delicious glass of wine on the terrace at the end of the day as the sun disappears behind the vines. The agriturismo offers an ideal combination of relaxation and entertainment. Buy Nobili Montepulciano wine and olive oil at the agriturismo. Delicious!